Nice old Gibb from the jumble - now refurbed for the coachroof. If your interested, heres what I'm doing on the coachroof. Lots have been said of the problems of lines to the cockpit. The kicking and topping are no problem with regard to reefing. Its the main which is the ogre - if you are still reefing at the mast. 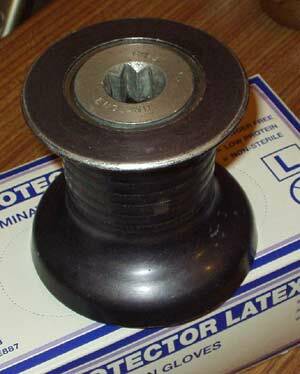 As it is - I have a cleat on the mast, set about head high, on the external halyard - which I use at present for raising the main from the cockpit. I often leave it just on this cam cleat while sialing - its never slipped. I can, if I wish make the halyard off to the horned cleats on the mast base. If you locate the lower, stand up, turning block in an ideal position - then the halyard can still be locked off in the camcleat at the mast - but on tensioning the line from the coachroof clutch, the tension will pull the line from the cleat. Anyway - if it does not, its no big deal - you just have to go up to the mast when its convenient and flip it out. You would not be able to drop the main from the cockpit if its still in the mast cleat. The whole point of this is to be able to drop the main from the cockpit, singlehanded - either generally when coming in, or as an emergency measure when things are fraught, and you just want less sail - like a lot less sail ! At least then you can go up and set a reef once things are sorted, auto pilot on, engine on - so you can run the boat into the seas - while you are up there. I mostly sail singlehanded - knowing I can drop the mainsail quickly is a real bonus. Maybe I'll be more ready to drop that first reef out when I'm on my own and the wind is light ! Its also really useful to be able just to drop the thing when coming in - especially other places than local waters, where the entrance fairway is likely to be the busiest place for other traffic in the whole trip. I've modified the main sail with a few carefully place rings for a downhaul line. This actually starts at the 1st reef, then goes up to the head of the sail through a series of rings, to a small block. then down to a boom fairlead - then back to the boom end. Its done that way, so that if one or more reefs are set - the downhaul line still works - as it goes up from the reefs, then down to the boom. Prob just a 4mm dyeema would do it. It should pull the main down and gather the leech in - enough to keep it together and not dropping to obstruct vision forward. I was just going to do the one clutch for the main - as the topping and kicking already can be done form the cockpit - albeit a bit of a lash up. Since I have the nice winch I may at least make it a double.